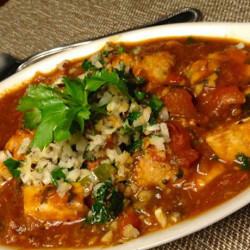 A few years back I fell in love with this sublime soup I first experienced at a restaurant serving up modern Indian cuisine in Harvard Square. Of course, what do I know? And it’s unclear why I was even skeptical to begin with, given my love of coconut-based soups like Vietnamese squash noodle soup with coconut and curry and Thai pumpkin soup with coconut, curry, and cashews. Anyway, when the soup arrived at the table, each of us took a taste, all murmuring “Mmmmmm…” and savoring each spoonful of soul-warming goodness. 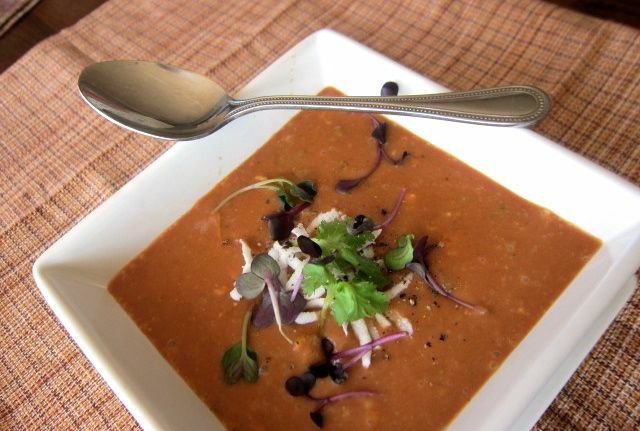 The lushness of traditional tomato soup combined with creamy coconut, spicy-sweet tamarind, and warm Indian spices like curry and garam masala came together beautifully. 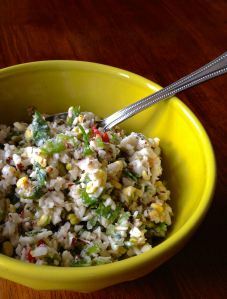 Enter today’s recipe, my own version I now make at home to similar tantalizing effect. Good thing, too, as that restaurant has since closed—but you can bet I’ll be serving this soup from my own kitchen for years to come. If you’re a regular reader of my blog, you know I love using leftovers creatively to make an entirely new dish, often sauce to soup. It’s an efficient use of cooking time that allows you to enjoy homemade dishes without starting from scratch each time. 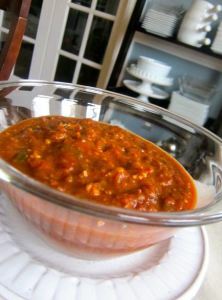 Think, for example, tomato sauce to tomato-basil bisque or Baingan Bharta (Indian curried roasted eggplant) to roasted eggplant soup. Similarly, if you start with my beloved Indian tomato sauce, then all you’ll need is a few more ingredients to make a glorious pot of this soup in about ten minutes. Alternatively, if you make it all at once starting with the saucy base, the soup will still be ready in about 45 minutes, depending on how savvy you are with a chopping knife. 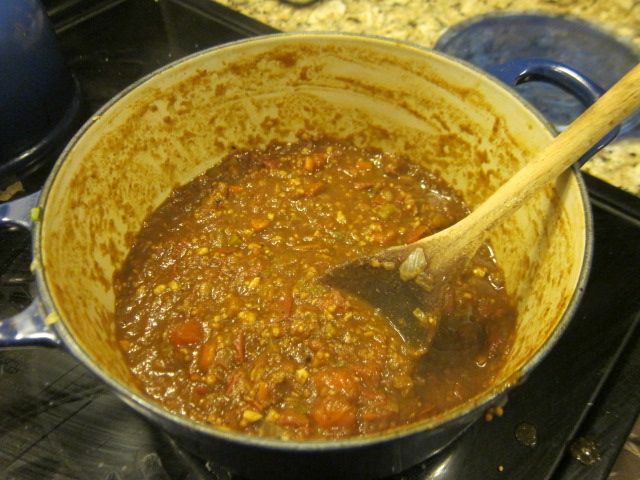 Heat up the leftover sauce in the pan, then stir in all ingredients, to taste. The key is to add the stock and coconut milk about 1 cup at a time, until you like the flavor profile and viscosity. Note that if you use “light” (low-calorie) coconut milk, your soup will be thin and have less of a pronounced coconut flavor than if you use full-fat coconut milk, which is why I prefer the latter. Also note that the additional spices add complexity, but aren’t completely necessary if you started with a fabulous sauce. And see how the rest of the ingredients are optional? Honestly, this soup is terrific even if you added nothing other than the stock and coconut milk, as the main flavors are coming from your sauce. The extra grated coconut adds additional texture to the soup, while the lime and sweetener provide balance, complexity, and body. Sure, I recommend using all the ingredients I listed—that’s why they’re here—but the key is to get you in the kitchen, cooking the way you like. Taste as you go and take it from there. Now add the liquids as previously described until you get where you want to be. You might find yourself happy with a thicker soup that uses 2 cups of stock and 2 cups of coconut milk (or 1 cup of stock and 2 cups milk). I could easily have stopped there, but I wanted to stretch out the recipe to ensure I had enough for the week and freezer. Thus, I ended up adding almost twice the amount of liquids I had anticipated, along with an extra cup of the leftover original sauce I had in the fridge. Success! One very big vat of soup indeed. As with all things I cook there is always a lot of room for creativity for you to make the dish as you like. In the version above, for example, I kept everything chunky, as you can see from the green (cilantro) and red (tomatoes and peppers). As well, you’ll note the soup has an amber-brown hue, given the golden color of my vegetable stock. Alternatively, you could go ahead and use an immersion blender to make your soup one homogeneous mixture. (Some finely grated coconut will still remain, in a good way). In fact, this is what I did last year when I created this recipe. 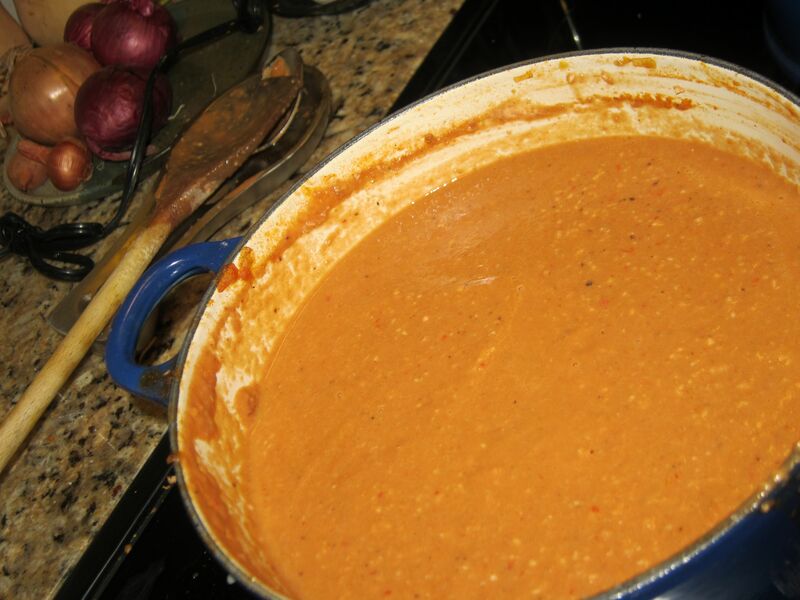 In that variant I used less stock and more tomatoes, giving the soup a richer tomato flavor and a redder color. 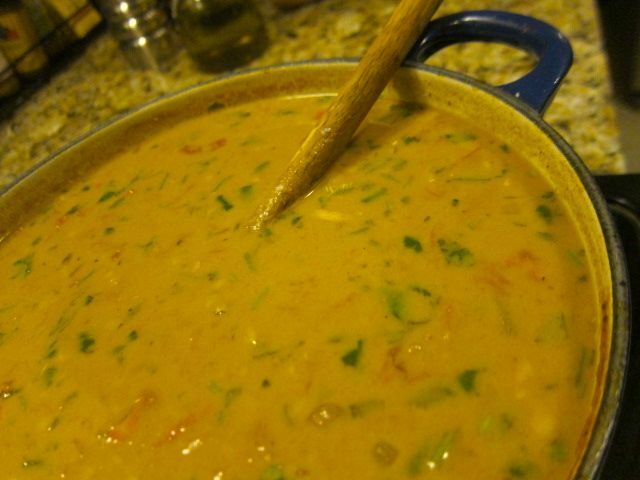 This time around, as we progressed through the soup during the week, I decided to stretch the recipe even further, later stirring in four cups of store-bought, no-sodium vegetable juice and an additional teaspoon of garam masala. This brought it back to a deeper tomato flavor like the first time I had made it. Needless detail, you think? I hope not. I share with you these real-life cooking experiences, since ultimately it’s you who has to like it, and peoples’ palates vary. In this case, my husband preferred the version I had made from the first vat pictured and I the one with extra tomato juice—not surprising, given I like tomato soup more than he does. And as to the question of to blend or not to blend it, too, is simply a matter of mood and preference. As you already noted, I blended the original recipe but not this week’s. Of the three variants discussed here, my favorite was #3, chunky with more pronounced tomato. This luscious soup requires no garnish and can be served up naked, all on its own. Or, you could add a dollop of plain yogurt, a traditional Indian condiment. If you want to get fancy, you could top with freshly grated coconut and cilantro, as I do here along with a few pretty purple radish greens I happened to have on hand. Alternatively, a spoonful of homemade authentic Indian coconut chutney would take it over the top. However you make it and however you serve it, I hope you enjoy this gorgeous soup.